Battered and bruised Tottenham will surely turn to their second string players for Wednesday�s dead rubber match against Apoel of Nicosia in the Champions League at Wembley. It could mean another chance for Juan Foyth to show his paces, probably alongside Davinson Sanchez. If 19-year-old Argentine Foyth shapes up well, he just might find himself making a Premier League debut against Stoke on Saturday while Sanchez serves a three-match ban that, in my opinion, is totally unjustified. At the most, he deserved a yellow card against Watford on Saturday for an outstretched arm that thumped into the face of Richarlison. If it had been a deliberate elbow I would have been the first to want to see a red card flourished by referee Martin Atkinson. But this was not a pre-mediated foul, unlike many of the nasty and often dangerous challenges that continually brought Harry Kane to his knees, and is described HERE by our travelling guru Paul H. Smith. Our Harry was unmercifully hacked and kicked throughout a match in which Spurs showed great character to salvage a point after carelessly conceding an early goal. They were back in control after a smartly taken equaliser by Son, but had to dig deep to stay in the game following the harsh dismissal of Sanchez. It is surely the responsibility of referees to protect players in this age of a softer more sanitised game. While Watford fouled Kane, Atkinson failed him. It was as if the referee had climbed into a time machine and gone back to football in the �sixties, when heavy and often reckless tackling was part and parcel of the game. Wouldn�t it be interesting if victims like Harry could charge the referee with being an accessory to the GBH treatment! That, nut-shelled, was how I saw the game. Kieran proved you can still warm your hands on the Spurs team spirit. Surely three successive victories are on their way (famous last words) before the mighty clash with champions elect Man City at the Etihad. Take no notice of the pessimists trying to turn a molehill of a problem into a mountain. Trust in Pochettino. I am off to Bahrain for a few days, researching for a novel I am writing (as you do). But I�m assured I will be able to watch � live � Spurs against Apoel and also Saturday�s Wembley challenge from Stoke City at a sports bar in Bahrain. Just need to learn to say �Come on you Spurs� in Arabic. I�m hoping to see a revival of the form that had us leaping about in excitement and expectation just a few short weeks ago. Tottenham�s recent loss of momentum can be traced back to the injury that sidelined Toby Alderweireld, who has revealed he may have to undergo an operation on his torn thigh muscle that will keep him out of action until the run-in to the end of the season. This will not stop the conjecture that the magnificent defender will be looking to move on to a club that can considerably increase his �60k a week wages. He has stubbornly refused to sign a new contract, knowing that when he is fully fit there will be a queue of major clubs ready to meet his demands. The Tottenham wage structure is going to have to be overhauled if the major players are not going to want to follow in the path of Kyle Walker, who trebled his wages when he made the move to Man City. I detest the way obscene money is ruining the Beautiful Game, but at the same time I can fully understand why the players want to climb aboard the gravy train. If they were my sons, I would be telling them to grab it while they can. But it doesn�t stop me recognising that the galloping greed will eventually destroy the spirit of the game. Stories gathering strength on the rumour mill are that Danny Rose could be on his way to Man United in the January transfer window, while Ross Barkley is coming to Tottenham. We shall see. Meantime, another brief note of support for Mauricio Pochettino, who is under a vicious online attack from a small but cynical lynch mob calling for his head. I see the same names cropping up as were prominent in the campaigns to get rid of Harry Redknapp and Tim Sherwood, and I often wonder if some of them are Gooners in disguise. They are total idiots and I know all sensible Spurs supporters � proper supporters � will ignore them and get behind Pochettino. 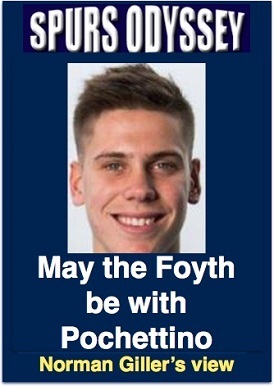 Mauricio, May the Foyth be with You. Plug time: My latest book � No. 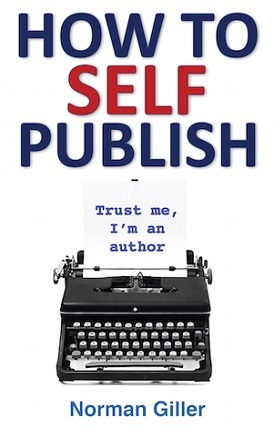 105 from my quill � is called �How to Self Publish�, and you can get a signed copy direct from me for just �8.50 plus p&p at www.normangillerbooks.com. Next summer, we just might be watching a World Cup finals match in which as many as ten players with Spurs affiliations may be taking part. England�s final group match against Belgium could feature any of the following: Danny Rose, Kyle Walker, Kieran Trippier, Jake Livermore, Eric Dier, Harry Winks, Dele Alli and Harry Kane for England, and Jan Vertonghen, Toby Alderweireld and Mousa Dembele for Belgium. Jan Vertonghen and Eric Dier watched the World Cup draw together, and when Maradona pulled out England�s name in the group headed by seeded Belgium they could not stop laughing. You can see how they reacted to the draw here on Jan�s Instagram post: http://www.bbc.co.uk/sport/football/42201746. On paper, star-studded Belgium should be too good for England. But who knows what will happen on the pitch when Harry comes up against club mates Jan and Toby. WEEK 17 of the Sports Odyssey Quiz League 2017-18. The rules are simple: I ask one Tottenham-related question for which a right answer earns you two points, and then a related teaser that can bring you an extra point. Which midfielder has won 81 international caps, and has twice played under Harry Redknapp? He joined Spurs in 2009 from which club? Please email your answers by Friday�s midnight deadline to: soql17@normangillerbooks.com. Answer to last week�s question was the dribbling Geordie Chris Waddle, whose transfer to Marseille helped keep Spurs afloat during troubled financial times. It was a move that robbed us of the chance of witnessing the dream combination of Gary Lineker, Chris Waddle, Gazza and Glenn Hoddle. What would that quartet cost today? First name drawn from the correct answers is Jim Wilson, from Henley, who has been a Spurs supporter since the early 70s. I will send Jim a screen version of my Spurs �67 book (I have now sold all copies, and the book raised �4,000 for the Tottenham Tribute Trust to help our old heroes Thank you all those Spurs Odyssey followers who gave their support). Thanks for your company. See you same time, same place next week (although, I will be in Bahrain!). COYS!